The California 20 was designed by C. William Lapworth in 1960 and went into production in 1961. 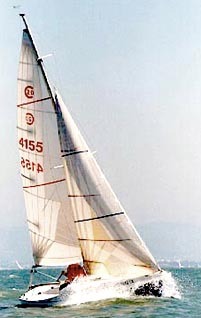 It quickly became the most popular of the Cal line of fiberglass sailboats and 1,945 of the boats were built. Most of the production occurred throughout the 60s when the Jensen Marine Factory in Costa Mesa, California was turning out as many as one boat a day! Though production ceased in 1975, the Cal 20 is still perhaps the most common boat you will see in marinas on the west coast of the U.S.
Cal 20s were (and still are) inexpensive to buy, own and maintain. The base price was $3,200 throughout most of the 60s which put her within reach of just about everyone. The cockpit is nearly 8' long and is self-bailing. Below she has four bunks, a head and storage bins. For her 20' length, she is one of the most practical boats imaginable. With the advent of expensive fiberglass resin (during the fuel crisis of 1973) and the new I.O.R. rule, Cal 20's gained rapidly in popularity. A lot of people wanted an active, simple, inexpensive one-design class boat that wasnt going to be outdated by the next measurement rule change. Even today the resale value of a good, clean Cal 20 is approximately what the same boat might have cost new 30 years ago! Cal 20s caught on quickly in many areas across the country. Today there are approximately twenty-five active Cal 20 fleets in the National Association; fleets from California to the East Coast, Hawaii, on various lakes, and a fleet in Canada. Cal 20's have always been actively raced and with the large number of boats around and the strong fleet associations the racing is very competitive. The National Association holds the annual National Championship Regatta. Held in quite a few different areas, this regatta is limited to the sixty top Cal 20 skippers from the various fleets across the country. To be able to sail in the National Championships a skipper must first qualify within his or her own local fleet. 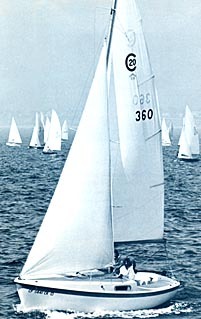 The 1977 Nationals were held on San Francisco Bay. San Francisco is known throughout the world as a heavy weather area. Indeed it is! You can count on the wind on most summer afternoons being upwards of 20 knots. A Cal 20 does quite well on the windy Bay, as it is a stiff boat with a relatively short rig. Racing a Cal 20 on the Bay requires some modifications to the boat and good strong rigging, easily workable by the crew. l have been rigging the 20 since 1970 when I bought my first, "Tour Jete". 4040, my second 20 was purchased in late 1974. She is a 1967 model, hull No. 1197. The boat spent the winter of 1975 on her trailer in my back yard while I contemplated and assembled her rigging. 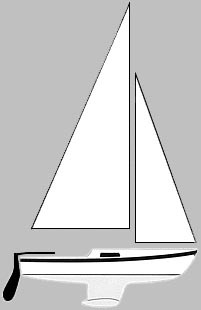 4040 represents my latest thinking on how to fit out and rig a Cal 20 for class racing without spinnaker gear, the way the boats are raced in the National Championships. Much of the rigging on 4040 evolved from my experiences over the years, as I rigged and sailed more and more of the stout little boats. When a Cal 20 comes from the factory, she has many inherent strong qualities and a few characteristics which, for lack of a better word, I call "weak"; these show up after racing the boat (particularly on the Bay). One of the best qualities about the boat is her large cockpit, which is nearly 8' long and self-bailing. This makes her a very good day sailer as well as a comfortable boat to race. When day sailing or cruising, four people in the large cockpit is quite comfortable. When racing, the crew doesn't have to leave the cockpit to get their weight in the right place because the right place for crew weight is at the forward end of the Cal 20 cockpit (by the bulkhead) where the crew naturally ends up. This "built-in" accommodation makes a Cal 20 a much more comfortable boat to race than many other boats around today. Let's talk about those "weak" spots that are aggravated by the harsh conditions of the Bay. The most glaring is the spreader brackets, the U-shaped stainless steel clips that hold the spreaders to the mast. The stock brackets are a bit light, and often fail after a few years of hard use. I make (and sell all over the country) a heavy-duty spreader bracket. The design is relatively the same, but of heavier stock. Other weak areas are the headstay fitting and the aft lower chainplates. These chainplates are only supported by the deck of the boat and though the design is sound, tend to weaken with years of racing. Both problem areas are relatively easy to fix or reinforce. The headstay can be attached to a stainless steel strap or tang, fastened directly to the hull of the boat, at the bow. The aft lower chainplates can be supported from below decks inside the boat with the addition of custom chainplates and turnbuckles (I have kits for both of these areas that can be easily installed). These modifications were taken care of on "4040" before we started racing her on the Bay. Custom rigging is added to a boat to enable the crew sailing her to set the sails quickly and easily under ever changing conditions. At the same time, the crew shouldn't have to move their weight around very much which is a problem on any small, light boat. On a Cal 20 if anyone has to leave the cockpit to do anything, the boat slows down dramatically. This is why all lines are led aft to cam cleats on the black anodized aluminum bridge. Having all the rigging adjustable from this central area of the boat enables the crew to make small adjustments to the rigging without having to move their weight around very much. The reduction in energy required to get the rigging adjusted, coupled with the fact that the crew isn't constantly having to shift their weight, means that the sails will be kept in better trim and the boat will be going faster more of the time. Having good rigging that is easy to work, and that works well, makes sailing much more enjoyable. You tend to learn faster how a sail should look in varying wind conditions and you tend to do what needs to be done, instead of putting it off and hoping that conditions will change. On "4040" we can do everything from the cockpit. We can reef the main in a matter of seconds even if it is blowing 30 knots! The power ratios on the gear are high. The boom vang is 8 to 1. The outhaul is 8 to 1. The jib halyard adjuster is 5 to 1. The cunningham downhaul and the main halyard adjuster are 4 to 1. On windy San Francisco Bay these power ratios are none too much. One of the most recent changes on my boat was going to swivel cam cleats on the highly used gear on the bridge. The three mainsail control cams on the center line of the bridge i.e. vang, cunningham downhaul and outhaul are all led through swivel cam cleats. So is the jib halyard adjuster. This makes it easier for the crew to adjust these highly used items from almost anywhere in the cockpit. Weather sheeting the jib sheets also helps to eliminate the crew having to shift their weight. Being able to sheet in the jib on the weather side of the boat, to the weather winch, enables the crew to keep the jib in good trim at all times, and their weight in the right position. The barney post puts the mainsheet swivel cam cleat where either the skipper or the crew can reach the mainsheet easily while facing forward. As you can tell, a lot of forethought and careful planning went into the preparation of Cal 20 "4040". All in all, everything has worked out very well, and I'm very happy with the boat. A view of a vintage Cal 20 from an original Jensen Marine brochure, circa 1966. More and more Cal 20's are being transformed into high-tech (and relatively low-buck) race machines.